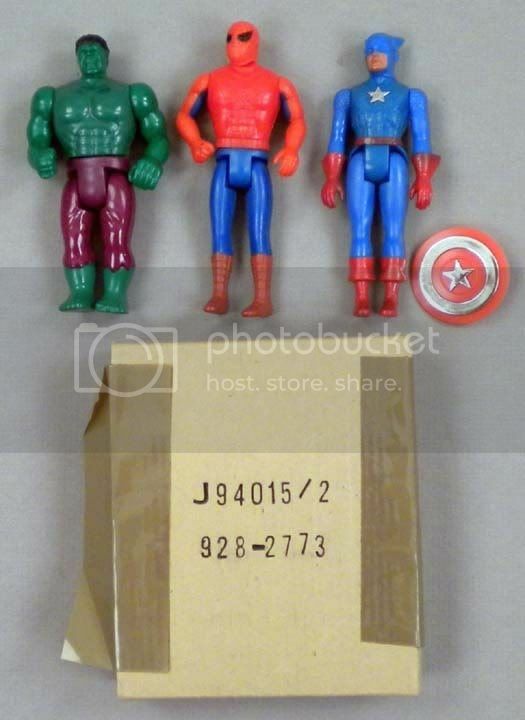 This is a vintage set of three action figures in the POCKET SUPER HEROES action figure line -- INCREDIBLE HULK ..... SPIDER-MAN ..... CAPTAIN AMERICA. These figures were part of a series of Mego toys released during the late 1970s and early 1980s. 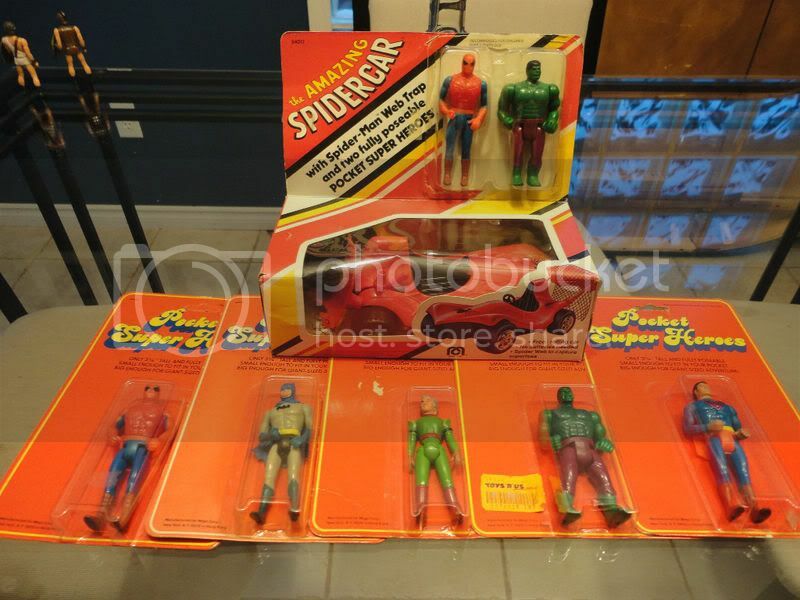 These action figures were likely part of some sort of mail-away offer, or perhaps a special catalog offering for Sears or some other retailer. The figures came sealed together inside a clear plastic bag, which was enclosed in a plain corrugated cardboard box. The following is marked on the box: J94015/2 ... 928-2773. The three figures are complete, with Captain America's shield included. These toys were based on characters created by Marvel comics. The posable figures each stand approximately 3.75 inches tall. They were made in Hong Kong, for Mego Toys. Hulk and Spiderman are copyrighted in 1975, while Captain America was copyrighted 1980 -- all by the Marvel Comics Group. The original box measures approximately 4x4.75x1 inches. The box was sealed with two pieces of brown plastic tape, but this tape has dried with age and has discolored the cardboard where it was affixed. Otherwise, the box is in excellent shape. The three figures themselves had never been taken out of the bag, until I removed them to photograph them. As usual for these figures, there is some oily residue on the legs of all figures -- likely for some mild secretion from the plastic -- but this could easily be cleaned off to be like new. Otherwise, the figures have never been played with, and they are all crisp, clean and in unused condition. 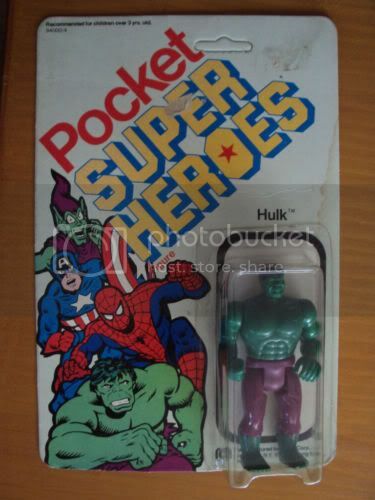 MEGO pocket super heroes HULK collectible 1980 new in package! RARE! White Card! 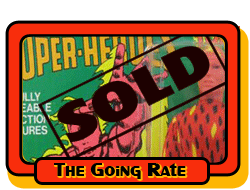 You are bidding on a very RARE MEGO Pocket Super Heroes toy BRAND NEW IN PACKAGE from 1980. If you are a toy collector, you know how RARE and collectible this toy is. This particular one is the HULK. White card edition, everything is original, NEVER opened. The card has NOT had the hanging chad punched out of it. Would make a great gift for any toy collector! Christmas is APPROACHING!!! free shipping to the lower 48! MOC MEGO POCKET HERO HULK ACTION FIGURE! WHITE CARD! RARE! IN STOCK NOW! This is a MINT ON CARD (MOC) HULK MEGO 3/34 POCKET SUPER HERO ACTION FIGURE ON THE ELUSIVE WHITE CARD! Card is a c.8 quality but there is NO seperation of the bubble and card! Vintage MEGO items are getting scarcer everyday...DONT MISS OUT! Shipping/insurance/handling is $8.00 (xtra for international). Good luck and HAPPY BIDDING! 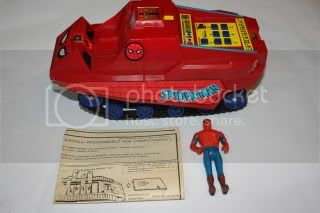 Mego Spidercar and MOC pocket hero lot! 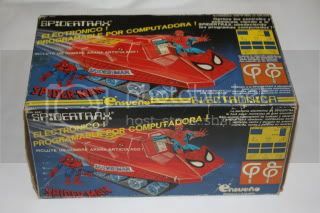 Super rare Spider Car Boxed Set, this packaging is an early transition piece. 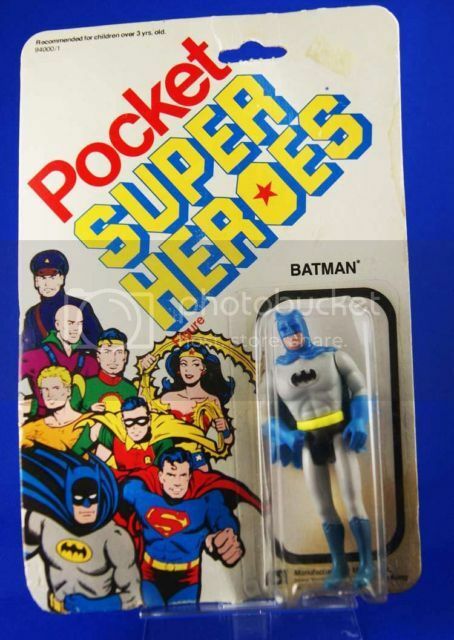 Even though the set clearly states "Pocket Heroes" early versions feature Comic Action heroes instead. Mego later on retooled this packaging by placing the figures in the box itself (the flap was heavy and easily damaged) and by switching Gobby with Hulk. 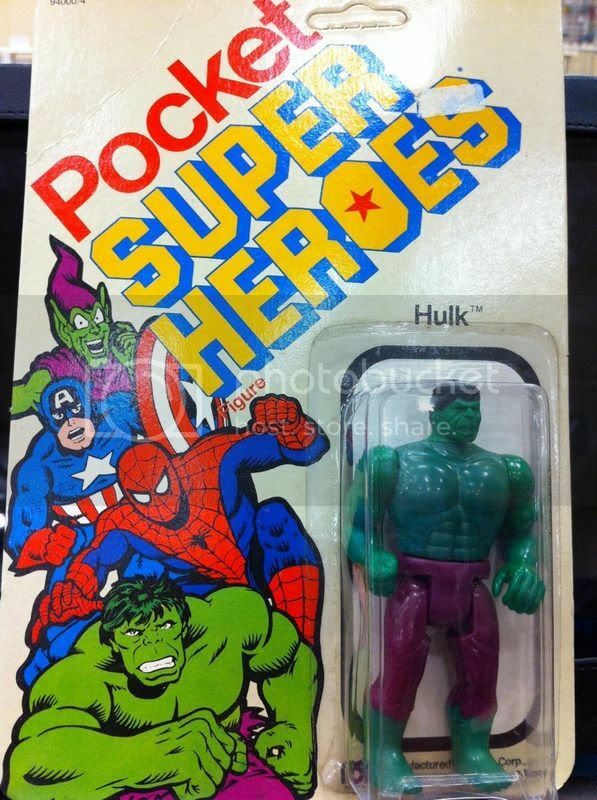 This example has spider-man and the hulk inside the bubble but the bubble was re-attached and the figures could be replacements for the originals. The figures in the bubble are mint and not played with so I could be wrong. The box shows signs of wear and a new piece of tape holding the flap shut which leads me to believe it was opened at some point but contents replaced and unplayed with. A very rare and beautiful piece for any pocket hero collector. We also have some rare carded figures. Batman, Spider-man, Hulk, Jor-el and Superman. Red cards are thought to be the earliest release in the Pocket Heroes line. Please look closely at pics for condition on the spidercar and carded figures. We just found an amazing Lili Ledy lot ready to send it to you private collection. 1980 MEGO Batmobile 1979 Batman & Robin Pocket Hero's in a 1981 MEGO Batmobile Box. This was the final boxed version of the MEGO Batmobile released in 1981. It was probably some of the last Superhero merchandising released by MEGO. had done before using images from the DC Style guide. Mego Batman Bat Shuttle Mint In Box! Rare & MIB! Rare mego bat shuttle mint in original box (box is also in amazing shape)! This is one of the most rare megos out there and it is priced well below estimated value! More pics available upon request! Check out my other toys and rare items including other incredibly rare mego! Thanks! Mego Robin Shuttle Mint In Box! Rare Batman Toy! Rare mego robin shuttle mint in original box (box is also in Near mint shape)! This is one of the most rare megos out there and it is priced well below estimated value! More pics available upon request! Only one on eBay! Also have the bat shuttle avail. Also the only two out there! These are beyond rare! Up for auction is an original Mego Pocket Superheroes Batman on the original rarer white card. In years of collecting these, Batman is actually the rarest figure in this card series, very few seem to pop up. Item is clearly sealed to the card, colours are bright but the card is slightly warped. You could probably straighten it out by using gentle pressure but I'll leave that up to you. 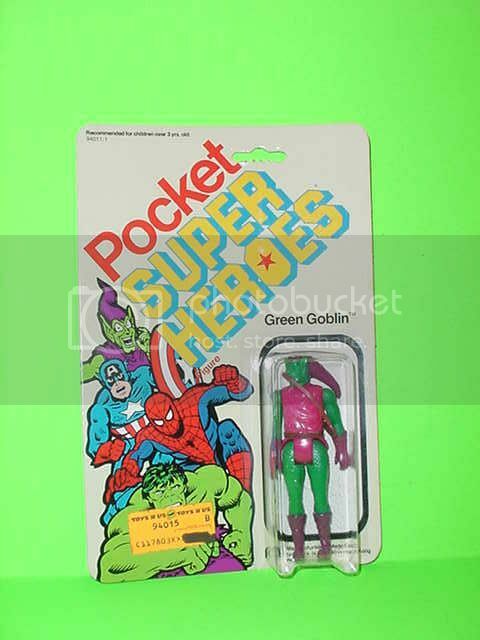 This auction is for a Mego MOC Pocket Super Heroes Green Goblin Figure that is MOC.The card dates 1980.This figure would make a great display for your collection.Figure will be sold as-is so please e-mail me with any questions.The figure and card looks the way you see them in the pictures,so PLEASE take the time to check out all 8 pictures in which it will show you the condition of this item,and also to let you judge its condition yourself.Thanks for looking and good luck. Buyer to pay for item/postage within 5 days. Please go see my other auctions for more cool Vintage toys and other models and Figures. Please Read for methods of payments.